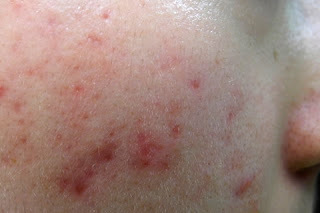 Acne scars often appear as colorless pits on the skin whereby acne marks shows as dark and flat spots. Acne scars are easily visible when exposed to direct lighting and they are harder to conceal as it's difficult to find something that fills them in. Acne marks, on the other hand, are flat and can be covered up with a makeup, although it's difficult to find a suitable skin color match for people of light skin tone. Between the two, acne marks are more noticeable on the skin, because they are simply darker. Acne scars are not similarly obvious unless viewed under dim lighting or when a person suffers of severe scarring. The question now is, which one is worse to have, acne scars? Acne scars, without a single doubt! The pitted orange peal-like texture that acne scars give the skin are, in most cases, permanent. Unfortunately, topical creams and lotions don't do much to treat the scars. Therefore, don't be fooled into believing that such claims are true. 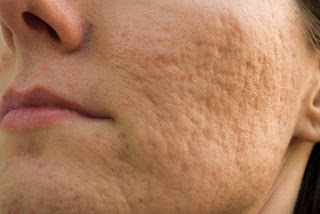 Acne scars never go away 100%, but their appearance can be significantly reduced via cosmetic procedures, including laser therapy, dermabrasion and microdermabrasion. Receiving silicone microdroplet injections also assists in minimizing the appearance of the scars. However, regardless of the medications or procedures that you go for, always keep in mind that the result may vary from one person to another. While acne scars appear as visible pits, acne marks shows as flat red or brown dots left behind by pimples. They often give the skin a blotchy flat look. Unlike the scars, acne marks disappear on their own, though this process may take a very long time. The skin of different people have different response to Acnes. Some people are more prone to scarring, while others are more susceptible to hyperpigmentation. Asian skin, for instance, can easily get dark marks, and it takes the tiniest and most short-lived pimple to do so. People forget that they still have to deal with the aftermath of acne even after the skin clears out. It's not like they really have a choice. Nevertheless, the chances of getting some can be minimized by avoiding bad habits such as popping any pimples. Remember, even if you are really careful about this, your skin may still scar and there's not much you can do about it. Whether you will get acne scars or acne marks just depends on your skin. Even though there are no guarantees for never getting a scar from a pimple, you can reduce the chances of that happening by not picking at spots and learning how to treat acne the correct way. There are countless reasons of why people desire to permanently rid of their body hair. Whether to look more feminine or to achieve smoother skin, laser hair removal has always been the best non-invasive way to do it. Unlike other methods such as waxing, razors and electrolysis, laser removal inflict (almost) no pain or downtime on patients. There are a variety of hair removal lasers available today. The effectiveness of most of these treatments is influenced by the skin type of the patient. For instance, the long pulsed Nd:YAG laser is best for people of darker skin tone while the Lightsheer (Diode) is suited for those of lighter skin. However, unlike the first, the diode laser has an advantageous property. When applied on the skin, a very small amount if its light is absorbed by the melanin. Thus it is generally considered a fair treatment option for people of both darker and lighter skin tones. And that's why we use it often to treat our patients. Hair follicles are the body organs that produce every strand of hair in your body. At Dermlaze, the diode laser hair removal is performed at the clinic in comfortable settings. During the treatment, our physician, Dr.Jes, directs a beam of concentrated light on your skin where heir is to be removed. The beam is absorbed by the skin pigment that surrounds the hair follicles and laser energy is converted to heat which damages the follicle. The damage causes significant delay in hair re-growth and, in most cases, permanent destruction of several hair follicles. Unlike electrolysis, which disables one follicle at a time, the laser can reach and destroy hundreds of follicles at once. During consultation, our physician will thoroughly discusses the treatment with you and decide whether you need a topical anaesthetic cream. Treatment time will depend upon the area to be treated. A system for cooling your skin will be used to remove heat as it leaves the follicles and should ensure a comfortable treatment. However, since the sensation varies from individual to individual, a topical anaesthesia can be provided. Otherwise, inform our physician if you are very sensitive. How do I know the treatment is best for me? You will be required to use a moisturizer and sun block for 2-3 weeks. Post laser care is individualized and it is important to follow the physician's advice and instructions exactly for optimum results.Results are observed within 3 weeks. Usually two to three treatments are required for maximum benefit. Some redness and slight swelling may be present in the area that has been treated; however, this should subside within a few hours. If any prolonged redness or swelling occurs consult the physician. Keep the treated area clean, use at least SPF 15 sunscreen when outdoors, and follow the physician’s instructions. You may need to be treated from 3-5 times at intervals of 3-8 weeks. There are three (3) phases of hair growth – anagen, catagen, and telogen. Only hairs in the active growth phase; anagen, can be successfully treated. Temporary pigmentation changes are possible but seldom occur. Always discuss your concerns with the physician prior to your treatment. The infrared energy delivered by this laser treatement can be used to remove all types of body hair. Sometimes "shaving bumps" can cover a follicle, but the penetrating light of the laser can still be safely used. Contact us to know further more about our hair removal treatment or to make an appointment with Dr. Jeswender.